The domain within your query sequence starts at position 67 and ends at position 126; the E-value for the MamL-1 domain shown below is 6.54e-30. 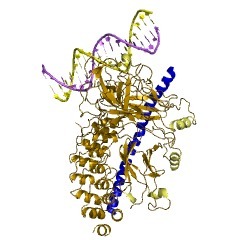 The MamL-1 domain is a polypeptide of up to 70 residues, numbers 15-67 of which adopt an elongated kinked helix that wraps around ANK and CSL forming one of the complexes in the build-up of the Notch transcriptional complex for recruiting general transcription factors. 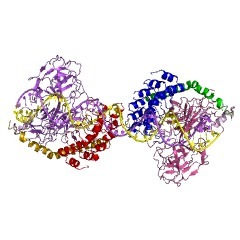 This entry represents the N-terminal domain found in a family of neurogenic mastermind-like proteins (MAMLs), which act as critical transcriptional co-activators for Notch signaling [(PUBMED:18758483), (PUBMED:18758478)]. Notch receptors are cleaved upon ligand engagement and the intracellular domain of Notch shuttles to the nucleus. MAMLs form a functional DNA-binding complex with the cleaved Notch receptor and the transcription factor CSL, thereby regulating transcriptional events that are specific to the Notch pathway. MAML proteins may also play roles as key transcriptional co-activators in other signal transduction pathways as well, including: muscle differentiation and myopathies (MEF2C) [(PUBMED:16510869)], tumour suppressor pathway (p53) [(PUBMED:17317671)] and colon carcinoma survival (beta-catenin) [(PUBMED:17875709)]. MAML proteins could mediate cross-talk among the various signaling pathways and the diverse activities of the MAML proteins converge to impact normal biological processes and human diseases, including cancers. The N-terminal domain of MAML proteins adopt an elongated kinked helix that wraps around ANK and CSL forming one of the complexes in the build-up of the Notch transcriptional complex for recruiting general transcription factors. This N-terminal domain is responsible for its interaction with the ankyrin repeat region of the Notch proteins NOTCH1 [(PUBMED:16880534)], NOTCH2 [(PUBMED:17699740)], NOTCH3 [(PUBMED:19150886)] and NOTCH4. 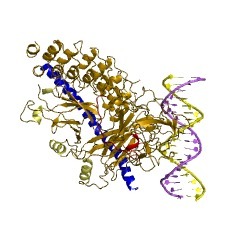 It forms a DNA-binding complex with Notch proteins and RBPSUH/RBP-J kappa/CBF1, and also binds CREBBP/CBP [(PUBMED:15961999)] and CDK8 [(PUBMED:15546612)]. The C-terminal region is required for transcriptional activation. There are 672 MamL-1 domains in 671 proteins in SMART's nrdb database. Taxonomic distribution of proteins containing MamL-1 domain. This tree includes only several representative species. The complete taxonomic breakdown of all proteins with MamL-1 domain is also avaliable. Click on the protein counts, or double click on taxonomic names to display all proteins containing MamL-1 domain in the selected taxonomic class.